Enthused by the initial response to Google's Android One, handset makers Karbonn, Spice and Intex are gearing up for round two with a slew of smartphone launches beginning December this year. The first set of Android One devices were launched last week, priced Rs. 6,299 onwards by Micromax, Karbonn and Spice. Karbonn is expected to be among the first ones to launch the newer Android One devices in the country. "Smartphone penetration in India still remains low and we believe there is still a huge scope...We will look at bringing in a device by December-end," Karbonn Mobiles Executive Director Shashin Devsare told PTI. 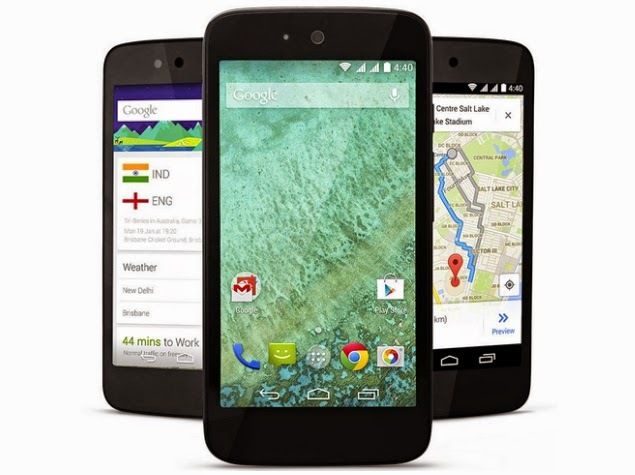 India is the first country where the US-based firm's Android One devices have been launched. "Our intent is to offer consumers a wide variety of products packed with features across various price points. We already have one of the most affordable smartphones with Firefox and we will continue to bring affordable devices to the market," he added. Google is rolling out the programme, which aims to bring affordable smartphone to the masses, across other markets like Indonesia, Philippines, Pakistan, Bangladesh, Nepal and Sri Lanka will follow in the coming months. It has also included new partners including Acer, Alcatel OneTouch, HTC, Asus and Lenovo, along with Indian brands like Xolo, Lava and Intex to bring in devices with various specifications across price points. By associating with Google as part of the Android one ecosystem, Intex will offer customers an enhanced experience, something unique in terms of design, pricing and functionality, Intex Business Head (Mobile) Sanjay Kalirona said. "We are actively working on bringing out the device to the market. It takes about 3-4 months for any final product to be made available in the market," Kalirona said but declined to comment on when the device would hit the market. However, sources said Intex could unveil its device by January next year. Analysts feel Android One will lead a fiercer competition in the mid-range smartphone market with firms offering better experience at price points in the range of Rs. 6,000-10,000.